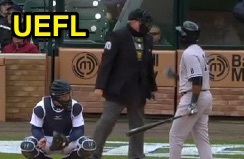 HP Umpire Paul Emmel ejected Tigers Manager Brad Ausmus for arguing a ball two call in the top of the 5th inning of the Yankees-Tigers game. With one out and none on, Yankees batter Starlin Castro took a 1-1 fastball from Tigers pitcher Buck Farmer for a called second ball. Replays indicate that of the two callable pitches ruled a ball and preceding ejection to Castro and to earlier batters Brian McCann (single) and Carlos Beltran (home run), all were properly officiated as balls (5/5, 100% Accuracy), including the call immediately preceding ejection, which was located off the inner edge of home plate and letter-high (px -1.272*, pz 3.369), the call was correct. At the time of the ejection, the Yankees were leading, 8-2. The Yankees ultimately won the contest, 8-4. This is Paul Emmel (50)'s first ejection of the 2016 MLB regular season. This is the third ejection of the 2016 MLB regular season. This is the 2nd Manager ejection of 2016. This is the Tigers' 1st ejection of 2016, 1st in the AL Central (DET 1; CLE, CWS, KC, MIN 0). This is Brad Ausmus' first ejection since August 21, 2015 (Ron Kulpa; QOC = U [Replay Review]). This is Paul Emmel's first ejection since May 23, 2015 (Brian Matusz; QOC = U [Illegal Substance]).